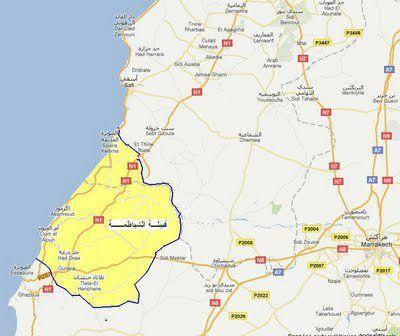 Chiadma is a territory located in the South of Morocco, dwelling mainly at the Atlantic coast in the region between Safi and Essaouira. They mainly speak Moroccan Arabic with a special accent. The language factor is the main difference to the neighbouring tribe further to the south, Haha. 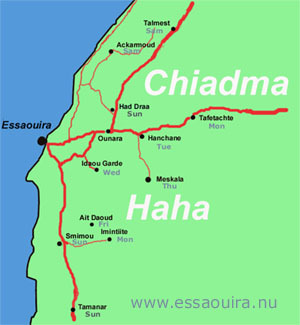 The Chiadma territory is divided in two regions. East of the road Ounara-Talmest, there is the plateau of Kabla - a dry ground suffering from drought. To the west between the mountain Djebel Hadid ( The sacred mountain of Regraga) and the Atlantic Ocean coastal plain of the Sahel. There are garden crops and seamen and they provide the local market with vegetables, fruits and fish. In the east Kabla they produce olive oil, grain and livestock. Linguistic difference between the Chiadma regions. It is not an ethnic opposition rather a cultural as expressed in different motives and patterns in art - paintings and carpets. The Regragas are the inhabitants of Chiadma. 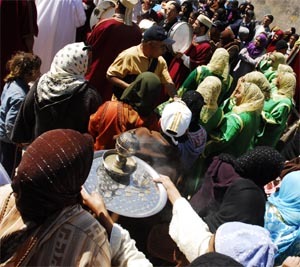 The Berber Regraga were the descendents of the 7 saints apostles of Islam. During a trip to the Mecca, they learnt the new religion and they were told by the Prophet to spread Islam to the Maghreb. Every spring (March-April)they carry out a pilgrimage of 44 sacred places : «the spring of Regraga». 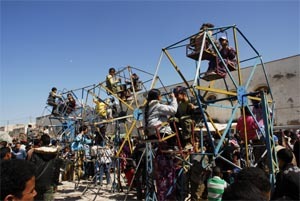 They bring the Baraka when they do their «daour» (trip) and at every stop you can find a fun fair and a souk where you can admire the «halqua», folkloristic shows with singers and dancers –the chikhates - a type of music that comes from the Bedouin singing. Regraga refers mainly to the large pilgrimage effectuated annually by the Chiadma tribes. They have 24 zaouias. It takes place in spring and lasts 39 days. 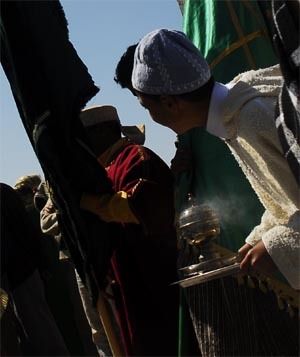 During these weeks, pilgrims visit a series of local shrines, from the mouth of the Tensift river south of Safi to the northern outskirts of the High Atlas, including the city of Essaouira itself. They are led by two groups that effectuate a kind of round trip, stopping at every shrine on the way. 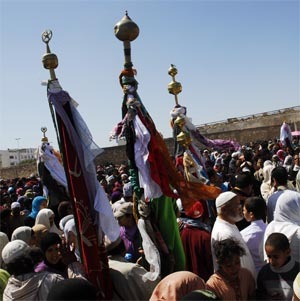 One must dress at every shrine a holy tent made of fan palm fibres and dyed with henna, the other one arrives in procession with a muqaddim (religious leader) riding a white horse. 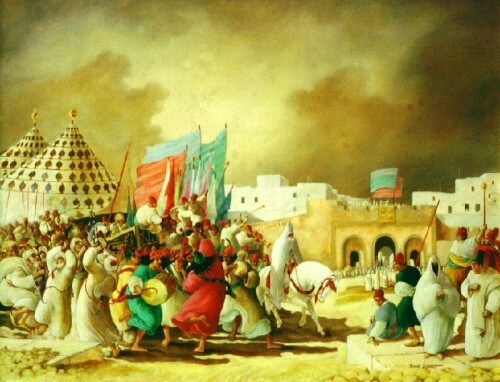 The founding myth recounts that the Berber saints went to Mecca to meet the Prophet Mohammed. They were Christians followers of Jesus, but were awaiting the arrival of a final prophet. They went to the messenger of God to convert to Islam. The Regraga were also revealing the glossolalia of the Prophet Mohammed. 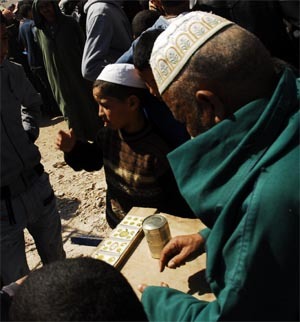 Indeed, the latter spontaneously understood the Berber language in which they spoke. However, his daughter Fatima did not understand a word unknown language, which to her looked like rejraja, that is to say, "empty handed". The Prophet said to her daughter: "You just give them their name. "He then instructed them to return to Maghreb to bring Islam. The seven saints obeyed and returned to their Berber country with an oracle from the prophet Mohammed. The tribes were converted en masse and reputation of Regraga spread widely, and well before the first historically attested Arab conquests. They had acquired the title and prestige of the Companions of Prophet. Each year, the seven holy warriors visited the tribes in the region to ensure that they did not apostasy: that is the origin of Daour. In the countryside in times of droughts, it is tradition to carry in the fields a white puppet with blossoms - named Laâroussa Chta. The chief of the Regraga Akarmoud is considered the chief of all Regraga. 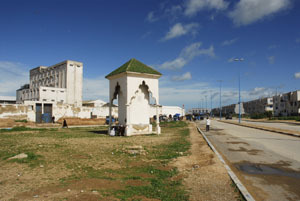 Laâroussa relies the oral tradition. A sacred tent in the red coulour is transported on the back of a dromedar och represents all the 12 Regraga Zaouias. The moqadems (chiefs) of their zaouias use the tent to recieve visitors and gve them baraka. The Khaïma applies the written tradition of The Ifriquiya. Corresponding to 13 territories or "tribes". 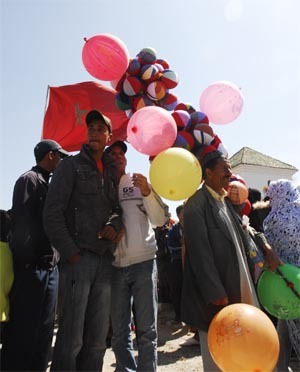 While the vast majority of Tunisians (98%), and other North Africans identify themselves culturally as Arabs , scientific studies suggest that they are ethnically closer to Berbers and some Europeans than Arabs. Ibn Khaldūn was a North African Arab Muslim historiographer and historian, regarded to be among the founding fathers of modern sociology, historiography, demography, and economics. 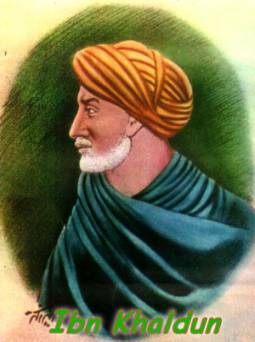 He is best known for his book, the Muqaddimah.